FORT WORTH, Texas (September 12, 2018) – Six past series champions, including seven-time titlist Jimmie Johnson, highlight the 16-driver field that has been set for the Monster Energy NASCAR Cup Series Playoffs, which open with Sunday’s South Point 400 at Las Vegas Motor Speedway. 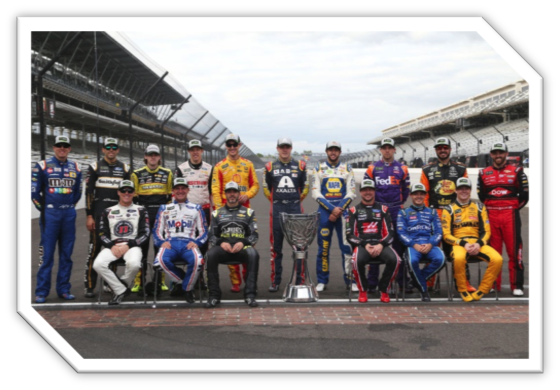 The series champions that qualified for the 10-week, postseason run for the Monster Energy NASCAR Cup Series Championship following Monday’s rain-delayed, regular-season finale at Indianapolis Motor Speedway are Johnson (2006-10, ’13, ’16), Martin Truex Jr. (2017), Kyle Busch (2015), Kevin Harvick (2014), Brad Keselowski (2012) and Kurt Busch (2004). Multiple race winners Harvick (seven wins), Kyle Busch (six), Truex Jr. (four), Clint Bowyer (two) and Keselowski (two) are joined by individual winners Kurt Busch, Joey Logano, Chase Elliott, Erik Jones and Austin Dillon in the group that automatically qualified for the postseason by virtue of a victory during the 26-race regular season. Six others – Ryan Blaney, Kyle Larson, Denny Hamlin, Aric Almirola, Johnson and Alex Bowman – earned berths by having the highest points position without a win, respectively, to fill out the remaining berths in the playoff field. The 10-race format to determine the Monster Energy NASCAR Cup Series champ includes a stop at Texas Motor Speedway on Sunday, Nov. 4, for the AAA Texas 500 in the Round of 8. The Round of 8 – which also includes races at Martinsville (Oct. 28) and Phoenix (Nov. 11) – determines which four drivers will advance to the Championship 4 and contend for the series championship Sunday, Nov. 18, at Homestead-Miami Speedway. Sunday’s South Point 400 will start at 2 p.m. CT and be aired live on the NBC Sports Network as well as PRN and SiriusXM Radio. 1. “Three-Headed Monster” – Kyle Busch, Harvick and Truex Jr. dominated the regular season, combining to win 17 of the 26 races heading into the postseason. 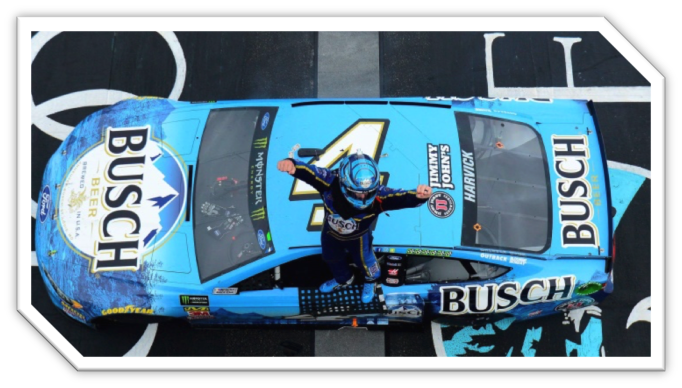 Busch won the regular-season title behind his six wins, including April’s O’Reilly Auto Parts 500 at Texas, while Harvick had a series-best seven and Truex Jr. added four to the mix. The three are heavy favorites to advance to the Championship Race at Homestead-Miami Speedway and each have a prime opportunity of winning their second Cup title. They all advanced to the Round of 4 last year, with Truex Jr. earning the crown as a result of winning the season finale. Busch finished runner-up in the race and Harvick was fourth. 2. “Viva Las Vegas” – While the AAA Texas 500 at Texas Motor Speedway remains in its traditional spot as the middle event of the Round of 8, there have been a few notable changes to the postseason schedule. 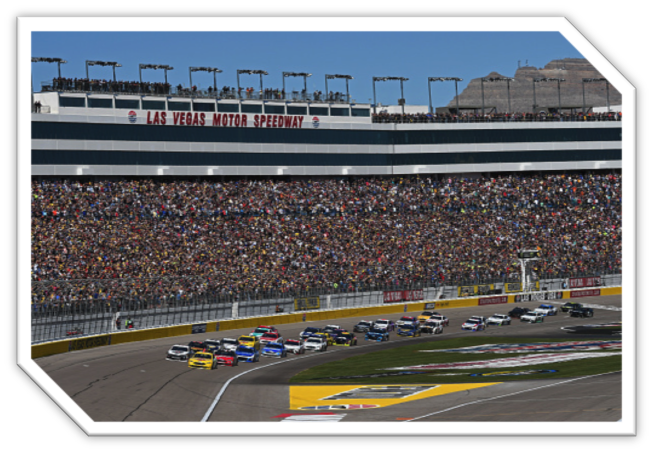 Las Vegas Motor Speedway added a second NASCAR date and replaced Chicagoland Speedway as the opening race in the Monster Energy NASCAR Cup Series Playoffs. Richmond International Raceway, which traditionally has been the regular-season finale, now becomes a playoff race in lieu of New Hampshire Motor Speedway and follows Las Vegas in the Round of 16. 3. “Beware of Brad” – Two weeks ago, Keselowski was winless in the first 24 regular season races and was in position to make the NASCAR Playoffs by virtue of his points position. The Team Penske driver also was not being counted on as a major threat to contend for the championship. Things have sure changed since then. Keselowski now enters the NASCAR Playoffs as the hottest driver in the series, having won the last two weeks with victories at Darlington Raceway and Indianapolis Motor Speedway, respectively. The 2012 Cup Series champion now heads to Vegas with a ton of momentum and even more confidence to contend with the Big Three. 4. “Smoke Show” – Stewart-Haas Racing,co-owned by three-time NASCAR Cup Series champion Tony “Smoke” Stewart, is in the midst of one of its most successful seasons as an organization. With Almirola joining race winners Harvick, Bowyer and Kurt Busch in the playoff field, Stewart-Haas Racing qualified all of its entries for the postseason. The feat is a first for the SHR organization that was formed with the addition of Stewart as a co-owner in 2009. The Ford-powered organization also combined to win 10 of the 26 regular season races, paced by a series-high seven by Harvick. Stewart-Haas Racing is chasing its first Cup crown since Harvick in 2014 and third overall with the other coming from Stewart in ’11. 5. 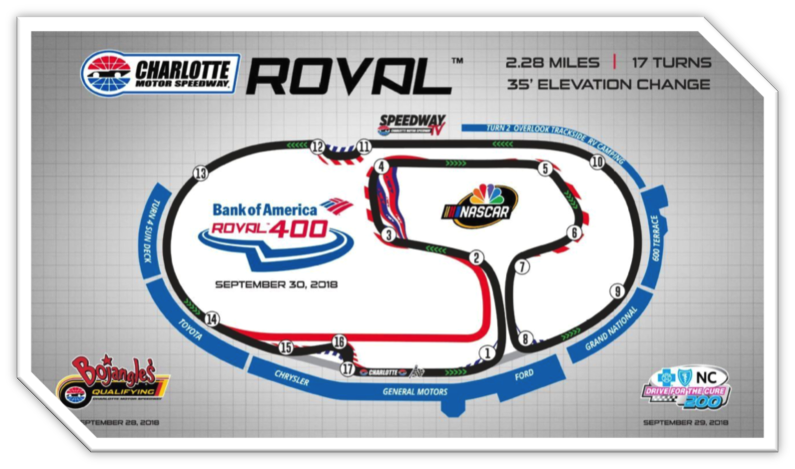 “Road Work Ahead” – Charlotte Motor Speedway has added a unique twist – and turns – to the NASCAR Playoffs with the debut of its ROVAL layout, which will be a road-course event that also incorporates the speedway’s traditional 1.5-mile oval. The result is a daunting 17-turn, 2.28-mile layout through the infield and all but 400 feet of the oval. The Bank of America 400 ROVAL is set for Sunday, Sept. 30, and will serve as an elimination race in the Round of 16, reducing the postseason field of contenders from 16 to 12. This will be the first road course race in the 14-year history of the NASCAR Playoffs and the first NASCAR national series road-course race in the speedway’s 58-year history. The NASCAR Playoffs will be contested across all three national series, but the postseason starts are staggered among them. The NASCAR Camping World Truck Series playoffs began Aug. 26 at Canadian Tire Motorsport Park and the second race will be Friday night at Las Vegas. Championship contender Justin Haley won the opener as six of the eight playoff contenders finished among the top 10. In addition to Haley, the drivers that qualified for the playoffs are Johnny Sauter, Brett Moffitt, Noah Gragson, Matt Crafton, Ben Rhodes, Stewart Friesen and Grant Enfinger. The Xfinity Series will run Saturday in Las Vegas, but the race will serve as the regular season finale to determine the field for the playoffs, which will begin the following week at Richmond. Texas Motor Speedway will play host to playoff races in all three national series. The Camping World Truck Series JAG Metals 350 will be held Friday, Nov. 2, and be followed by the Xfinity Series O’Reilly Auto Parts 300 on Saturday, Nov. 3, and the Monster Energy NASCAR Cup Series AAA Texas 500 on Sunday, Nov. 4. For ticket or race information, please visit www.texasmotorspeedway.com or call the speedway ticket office at 817.215.8500. 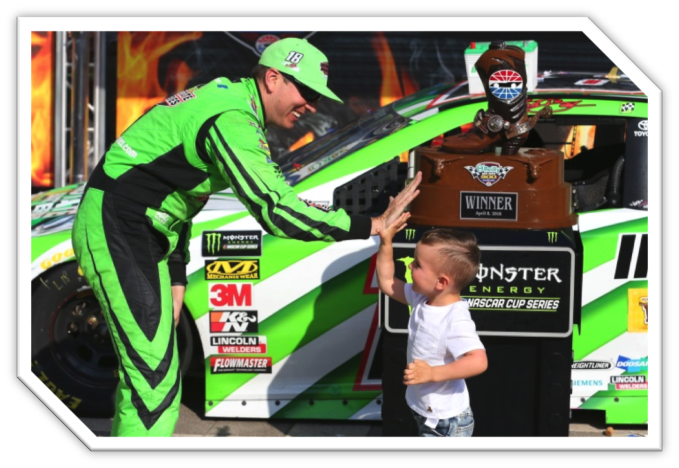 With an adult ticket purchase, accompanying tickets for children 12 and under are $10 for the Monster Energy NASCAR Cup Series playoff race and free for the Xfinity and Camping World Truck Series playoff races. *-All times listed are Central. **-Denotes round elimination race in which four drivers will be eliminated from playoff contention.